× five = forty Required Please enter the correct value. 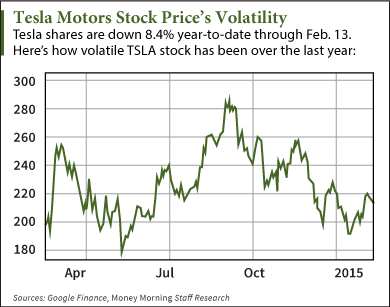 It's time to check in on one of the most volatile stocks on the market, Tesla Motors Inc. (Nasdaq: TSLA). The Tesla Motors stock price in 2015 has ranged from a high of $223.40 to a low of $185. It's down 3.2% today (Monday, March 2) after Bank of America analysts maintained their "Underperform" rating. One of its most dramatic plunges came after it released disappointing Q4 earnings Feb. 11. TSLA opened 9% lower Feb. 12 after it fell short on earnings per share (EPS), revenue, and vehicle deliveries. As we've stressed at Money Morning, Tesla stock is not for conservative investors. It will be volatile. It doesn't fit in every portfolio. But the profit potential it's tapping in to with new projects and investments will pay off for patient investors. "I believe Tesla is one of the best long-term investments an investor can make at the moment," Money Morning's Chief Investment Strategist Keith Fitz-Gerald said. "If there is ever a case to buy a few shares and tuck them away, this is it." What the short-term performance of Tesla's shares fails to reflect is how the company is disrupting a couple areas within the tech sector. "Tesla is a game changer on several levels," Fitz-Gerald said. "First, it's rewriting the auto industry's outdated sales model and forcing change in Detroit and beyond. Second, it's developing new technology that reaches beyond anything out there and beyond the cars where it will first be applied." One of Tesla's biggest goals is a lithium ion battery plant: the Gigafactory. Tesla's Gigafactory is a $5 billion undertaking designed to revolutionize the lithium-ion battery market. According to the company, it will reduce cell costs dramatically, and increase output significantly. The Gigafactory is expected to power more than 500,000 vehicles annually by 2020. That's more annual production than was produced globally in 2013. When these batteries are mass produced, the cost of Tesla's vehicles should drop accordingly. That will make the company more than just a luxury vehicle maker. 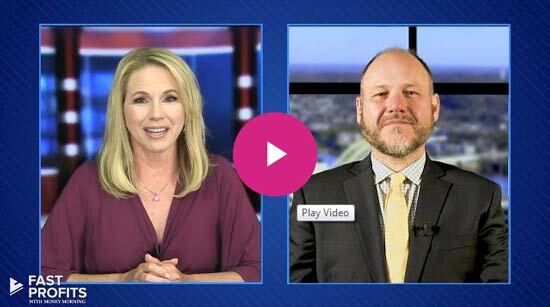 "The Gigafactory is expected to have a dramatic effect on the energy storage market, helping to bring battery costs down by as much as half by 2020," Money Morning's Global Energy Strategist Dr. Kent Moors said. And the applications stretch far beyond cars. Lithium ion batteries are also used in tablets, smartphones, and laptops. Theres been news that tesla and apple managemnet are meeting today to discuss further investments from apple in tesla. Although there`s been massive calls on tesla stock at 197 . Hope to read something official soon.